value and curb appeal of your home. Landscape design is a home improvement that not only adds value immediately, but can also increase in value over the years. Landscape design involves more than planting a few flowers. Please keep in mind when planting flowers or scrubs the plant size, maturity and diversity of plants are important. Adding pavers to walkway - This can add value while decreasing maintenance. With the help of Ludlow Services we can create a gorgeous landscape that will enhance the value of your home. 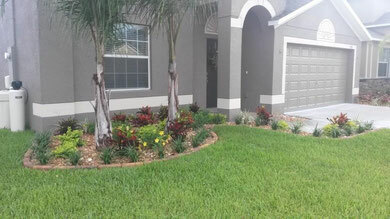 We can match landscape design to your home style. If you don't have a plan for your landscaping we can make suggestions and put together a strategy for you.